I was looking for a drink to make with heavy cream when I happened upon this little beauty from CVS. The appetizer is perhaps oddly named, because with heavy cream and two very potent bitters, I think it walks the line between dessert and digestif. A proper aperitif should be dry and stimulating to the appetite, whereas this drink feels more like something to sip after a long meal. The original drink called for Dubonnet, which I did not have, but on CVS he substituted Bonal, which I also did not have. I chose to use Cardamaro, because I find it to be similar to Bonal, though probably Dubbonet is more like sweet vermouth than Cardamaro. I wouldn’t stress about it, as long as you use a decently sweet and bitter and high-quality fortified wine, because Fernet and Angostura are the real heroes of this drink. 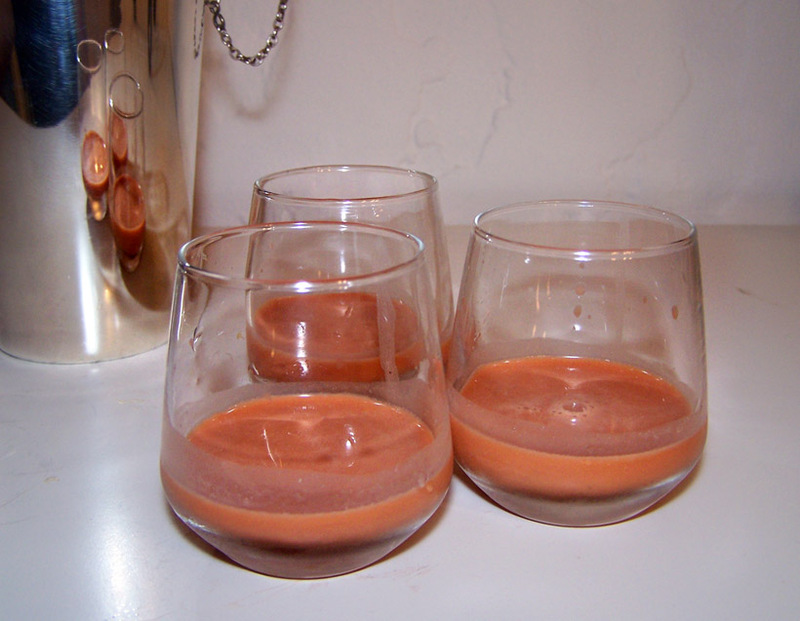 Shake over ice and double-strain into a fluted glass. The original recipe called for a cocktail glass, but I chose to use a fluted one, because the purpose of a cocktail glass’ wide mouth is to diffuse the fumes from the alcohol. The greater surface area of the cocktail glass also allows more heat to bleed into the drink, so it will warm quicker. I wanted to capture the aromas from the bitters when sipping this drink, rather than release them into the air with a cocktail glass. I also wanted to split the drink between three people, and these were convenient. But the logic is sound. The sweetness of the dairy perfectly modulated the bitterness of the Fernet and Angostura. This was the most unusual drink I have tried all year, and I greatly enjoyed it. Somehow, the combination of spices and the cream made me feel like I was sipping on some kind of Tikka Masala. There was nothing savory in the drink, but still, the overall impression was one of curry. I made this drink at the end of the night, and to be honest I was looking for something with a bit more of a dessert quality to it, so I mixed up a second round, swapping Fernet Branca with Branca Menta, which is Fernet Branca’s much sweeter cousin. The extra sugar greatly diminished the sensation of eating curry, and made this drink feel like a grown-up Grasshopper. In the future, I will tend to make the Branca Menta variation, but I encourage you to try it both ways. Categories: modern drinks | Tags: angostura bitters, bitter, bitters, cardamaro, cocktail, cocktails, cream, drinking, drinks, fernet, fernet branca, mixed drinks, mixology, shaken, shooter, shooters | Permalink. You don’t happen to know of a good comparison of apertifs, do you? I’ve been under a rock, I guess, and have always just picked up a basic bottle of sweet vermouth and a basic bottle of dry vermouth. Now I see all different types of vermouths that are noted for different things, and other apertif wines used instead of vermouths, and frankly, I’m rather confused about which are good to have on hand. And about which are things that are good to have on hand also, but only really if I have the money to have more than a few. fortifies wines and some low-proof spirits ought to be stored in the refrigerator. preferably vacuum sealed with one of these: http://www.amazon.com/Vacu-Vin-3-Piece-Saver-Stopper/dp/B00004SAF4. I have found that darker, sweeter vermouths and similar keep longer than lighter, clearer ones, but in either case, two months is probably the limit. Jamie Boudreau says a week, but in you’re home bar that really isn’t practical, and properly stored vermouth retains most of its goodness for quite a bit longer than that. I always stock a minimum of one sweet and one dry vermouth, generally Dolin dry and Carpano Antica Formula. They cost a bit more, but it’s worth it, I promise.